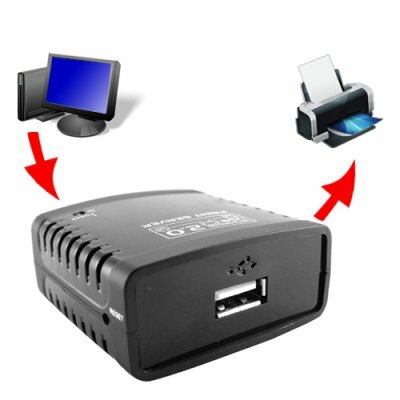 Successfully Added USB Print Server for Small or Homes Offices to your Shopping Cart. This USB print server lets you share a USB printer on your small office or home network. Does your small or home office network use a shared printer? If the printer is in your office, then you probably love how every time someone prints, they have to run into your office to get it. And the other people in your office definitely love how they have to turn on your computer before they can print anything. And you all love how any time your computer crashes or restarts, no one on your network can print anything. Right? We didn't think so. Purchase this USB print server today and give your small or home office network the flexibility and accessibility it deserves. With this USB print server, you can place your printer anywhere in your office for greater convenience. One user's computer crash will never disrupt another user's print job again. You'll never have to leave one computer on all day just so you can occassionally use the printer. You won't have to go through the hassle of looking for and re-installing printer drivers just because you want to move the printer to another location. And if you're accessing your wireless network with your laptop, you can print quickly and easily from anywhere in your office, with no wires to tie you down! This USB print server couldn't be easier to use. Just pop the software into your computer, plug the USB server into your wired or wireless router with a regular ethernet cable, then connect your USB printer to the print server. That's it! The USB print server is now hosting your printer. Any user on your network can access the shared printer just as if it were attached to their computer. The built-in server management system allows you to configure, monitor and reset the server through a web browser. You can even password protect the printer for your security. This hot new product is in stock now for single piece or large quantity orders. Order yours today and start being more productive tomorrow! Chinavasion's factory-direct prices make this great for personal use or resale in your store or online shop. This USB print server has 1 USB port and supports one USB printer at a time. A shared printer can be used by one user at a time. Each user simply has to press "Disconnect" when they are finished printing. Buy several USB print servers to share multiple USB printers in different locations. How many USB printers can I connect to this USB Print Server at the same time? ONE. Even if you use a USB hub, the USB print server will only recognize the first printer you plug in. Can I use this USB print server on my wireless network? Yes. Just plug the USB print server into your wireless hub, and you can access it through your network. This CD that comes with this USB print server has two different softwares, which one should I use? For best results, use the software called "Networking USB Server." This lets you connect to a shared printer quickly and easily. on 2009-11-10 07:55:42 Perfect product for my needs. The server was very easy to install, now i have access to the printer from anywhere in the house with my wireless network.